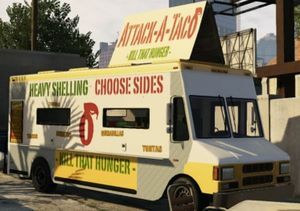 A Taco Van in Grand Theft Auto V.. The Brute Taco Van is a commercial vehicle appearing in Grand Theft Auto V and Grand Theft Auto Online. The Taco Vans are not always found in these locations. This page was last modified on 6 December 2013, at 19:23.